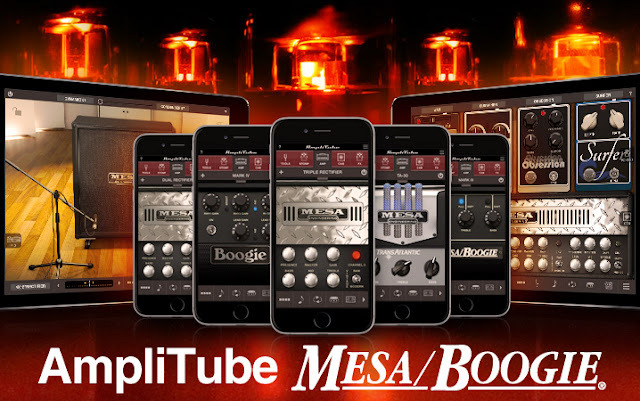 IK Multimedia is proud to debut the release of AmpliTube® MESA/Boogie® for iPhone and iPad. Based on the popular desktop tone software, the AmpliTube MESA/Boogie app is a close collaboration between IK Multimedia and the R&D Team at Mesa Engineering that lets musicians process their guitar or bass tone with some of the boutique manufacturer's most iconic amplifiers and cabinets. AmpliTube MESA/Boogie gives guitarists, producers, engineers and more the power to play through models of some of MESA/Boogie's most famous genre-defining amplifiers and cabinets. These exciting co-developed models deliver everything from the gorgeous clean sounds, percussive aggression and tight crunch of the Dual Rectifier and Triple Rectifier to the violin-like sustain of the MARK III and MARK IVto the ultra-flexible mid-gain British leanings of the TransAtlantic TA-30. MESA/Boogie TransAtlantic TA-30: A decidedly British MESA/Boogie tribute. This model captures the essence of what, for MESA, was an exercise in simplicity of operation and comprehensive tonal control. It features two-channel operation and 5 distinct "Mode" voicing choices that reference several classic British and American circuits. Throw in the Gain Boost feature and two high-gain options (HI 1 and HI 2 in Channel 2), and this model covers everything from classic 60's to crushing contemporary. Each channel also features the flexibility of 3 levels of output power. This allows for a full range of power response and character that adds yet another level of accuracy and authenticity to its preamp sounds! This amp may be the most versatile yet simple-to-use MESA amplifier ever made, and it covers anything and everything the other models might miss due to their higher power ranges and gain structures. In addition to these extremely popular and powerful amplifier/cabinet combos, AmpliTube MESA/Boogie also comes with 6 stomps. Made by the team at IK, these stomps compliment the creativity of the name-brand gear. There's a Noise Filter for gating unwanted sound between riffs. There's a Metal Wah that's tailor made for adding colour to those righteous metal solos. There's a Sustainer that punches up solos and allows for unreal note sustain. Obsession is a delay pedal with EQ control. Surfer is a shimmering flanger that can be used to add different modulation flavors to regular playing and soloing. And, finally,Monster Booster can be used to boost the overall signal to the amps by up to 25dB.